I often find myself enjoying games that simulate, to some degree, what it might be like to have something which modern society considers a “normal” job. I’ve yet to figure out exactly why I enjoy games like Papers, Please as much as I do. These “job simulator” games fill a very specific niche. I can’t imagine very many people would find a game enjoyable if it requires players to pore over increasing amounts of paperwork in decreasing amounts of time so that they can properly grant or deny people the ability to enter a country. Yet, as I mentioned, I inexplicably hold a game which tasks players with doing exactly that, (as well as other such games,) in rather high regard. Within this article, however, I won’t be delving into my own psyche in a likely-fruitless attempt to figure out why I enjoy these types of games so much. Instead, I shall bring to your attention a game which is admittedly rather similar to Papers, Please; but has its own unique setting and mechanics. The game in question is known as Peace, Death!. Within the game, your character is simply referred to as a “Reaper” (rather than the Reaper, which implies that there may be more Reapers than I expected). Your workplace is known as “Apocalypse, Inc.” Perhaps unsurprisingly based on that, you’re a direct subordinate to the Four Horsemen of the Apocalypse: Death, Famine, War, and Pestilence. Due to your status as a Reaper, you answer to Death for the most part. The other Horsemen may make requests of you periodically, which usually grant you extra favor with a given Horseman should you fulfill their request. At the start of each workday, Death assigns you your day’s workload and advises you of anything you need to look out for while going about your work. I’ll explain what I mean by “anything you need to look out for” shortly. 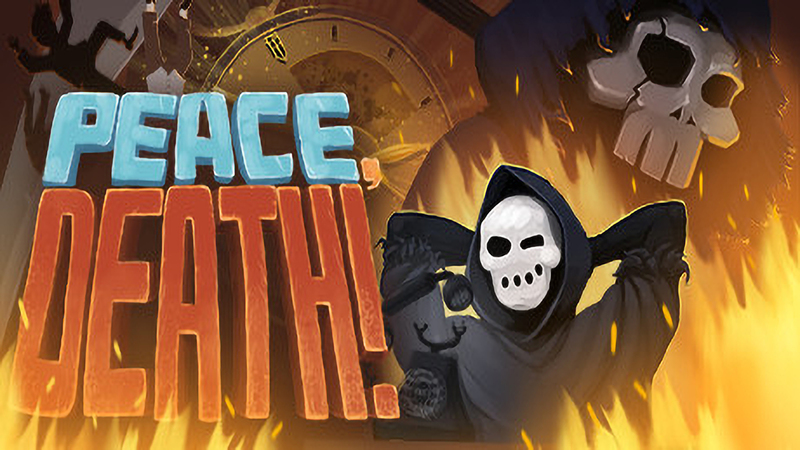 The first similarity I’ve noticed between Papers, Please and Peace, Death! is that both games begin with simple mechanics to give players a “feel” for how the game is meant to be played, but their difficulty curves can potentially become quite overwhelming as you progress through them. For example, on your first workday in Papers, Please, you only need to make sure that citizens of your country have their government-issued identification, and that foreigners have valid passports. Near the end of the game, however, you’re tasked with looking over several more different types of paperwork within a limited amount of time. This usually means that players are at least somewhat more likely to make mistakes during the process; even the smallest overlooked details can mean failure. These same principles apply within Peace, Death! as well. In Papers, Please, the player’s main objective is to quickly and accurately determine who can and cannot legally enter the country of Arstotzka. Similarly, in Peace, Death!, your objective is to quickly and accurately determine who goes to Heaven, who goes to Hell and, later on in the campaign, who goes to Purgatory. I stated earlier that at the start of each workday, your boss assigns you your workload and advises you of any traits for which you need to carefully examine anyone who appears before you awaiting judgment. Allow me to elaborate upon that statement. As aforementioned, your first day or two on the job are simpler than usual in order to get you acclimated to your duties. On your first day, you don’t have much to worry about; all you need to do is send demons to Hell and anyone that isn’t a demon to Heaven. On your second day, your boss mentions that humans might have horns granted to them by the Devil, which is a sign that they should be sent to Hell as opposed to sending normal humans to Heaven. As you progress through the campaign in your total of seven weeks on the job, you’ll have to deal with such things as hats that conceal demonic horns, glasses that conceal “demon eyes,” weapons which may or may not be surrendered, pools of blood that may or may not wash away, people firmly holding either holy or unholy texts, and many other traits added to the list based on your progression. These traits determine where each person who appears before you is ultimately sent. For example, if a person appears before you with a weapon in their possession, clicking on their weapon may cause them to surrender it. If this happens, and there are no other traits present which condemn them to Hell, the person is considered to have “renounced violence” and should be sent to Purgatory. Alternatively, if the person does not surrender their weapon or certain other traits are present, they are to be sent to Hell. The procedure is the same for clients who appear before you with pools of blood on either their torso or the floor beneath them. If clicking on the blood causes it to wash away, the client is to be sent to Purgatory; if not, they shall board the next elevator to Hell. I think I’ve explained the game’s central mechanics well enough. Now, I’d like to discuss my thoughts about the other aspects of Peace, Death! which seemed to draw me to this particular title. As I said at the beginning of this review, I quite enjoy games that simulate “normal” jobs to some degree. The idea of the Grim Reaper (or one of them, at least) determining the final fate of those who come before him is not exactly an entirely new concept, as far as I’m aware. The Reaper passing final judgment upon mortals within his cubicle as part of an office job during which he answers to the Four Horsemen of the Apocalypse, however, is truly novel and amusing to me. In terms of the difficulty of the gameplay, I acknowledge that Peace, Death!’s difficulty curve can potentially be quite overwhelming. As far as I’m concerned, if some players take longer to get acclimated to the game, and perhaps have to play through certain in-game days more than once, that’s completely understandable. After all, as I’ve mentioned, you only have a few seconds to evaluate each client before sending them to their final destination; with the list of traits for which you have to examine each client growing almost incessantly. It can be quite difficult indeed to test each client thoroughly and get them where they’re meant to go within the time you’re allotted. I’ve personally made my fair share of mistakes, usually by accidentally sending a small handful of demons to Heaven. Speaking of demons, though, that brings me to another aspect of Peace, Death! which I greatly enjoy. The game contains more than its fair share of pop culture references. For example, when dealing with actual in-game demons, you’ll find that one of them which appears rather frequently is straight out of Doom. Additionally, I’ve noticed that quite a few of the male humans who appear before you happen to sound very suspiciously like Mike Judge in-character as Hank Hill, which amuses me to no end. As a final point on this matter, I am unshakably convinced that during the hour and ten minutes or so that I spent recording footage of Peace, Death! for this article, I sent none other than the game’s version of Gabe Newell to Heaven at least twice. If that possibility doesn’t endear you to this game, or at least pique your interest in it to some degree, I don’t know what will. On a final note, the last thing I’d like to briefly discuss about Peace, Death! is the length of its campaign. As I mentioned earlier, the game’s campaign consists of seven full weeks; honestly, I wish the campaign was at least somewhat longer than that. I was able to finish the game in a single hour-and-a-half-long sitting, which actually saddened me a fair bit. As far as I’m aware, Peace, Death! doesn’t currently offer anything resembling the various “endless” modes present within Papers, Please. If the game had something along those lines to offer, which would mean it was unlikely to be finished within the length of an average lunch break, I would find myself almost endlessly entertained by a five-dollar game. I can’t recall any other games about which I could say that. Aside from this matter, though, I hope to have piqued your interest in this short, yet memorable title. PREVIOUS Previous post: Why are the Bioware Reports Surprising?